North Korea's rocket launch has set the hawks circling, threatening Obama's non-proliferation agenda before it's off the ground. Chuck Hagel is pushing back. 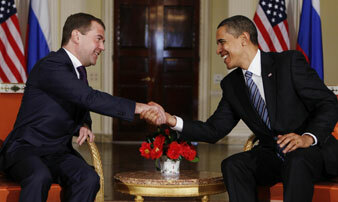 Obama and Medvedev’s bold plan (hatched during the G-20 summit) to fight nuclear proliferation is already under threat. North Korea has launched a rocket into the Pacific Ocean. Now, the hawks are circling, threatening President Obama’s sane approach to non-proliferation before it’s even off the ground. Witness Newt Gingrich on Fox today, reiterating his lunatic assertion that the US should have prevented the launch by any means necessary. So it’s all the more crucial and welcome to see former Republican US Senator Chuck Hagel offering a powerful voice of reason on behalf of Global Zero–an international, non-partisan initiative dedicated to achieving a binding, verifiable agreement to eliminate all nuclear weapons. Now is not the time to listen to those who would lead us backwards. But it is a great moment to lend your voice to Global Zero.